Happy Birthday Cairo and Kinsley! Ok, let me just start off by saying that joint birthday parties are the best. Kinsley and Cairo.......you will be having a joint party for the rest of your lives so get used to it. These cuties are born exactly 4 weeks apart and life just got so much better when they joined us. They both exude happiness so what better theme than a Rainbow party! Gayle and Jean from Pretty Little Social helped us select the perfect shades of mini balloons to create this beautiful Rainbow garland. They own a party shop on Etsy (one of our favourite places to shop) and were so kind to help us make our Rainbow dream come true. The DIY was way easier than we expected and it turned out gorgeous. The perfect backdrop for a photo op place for our party! 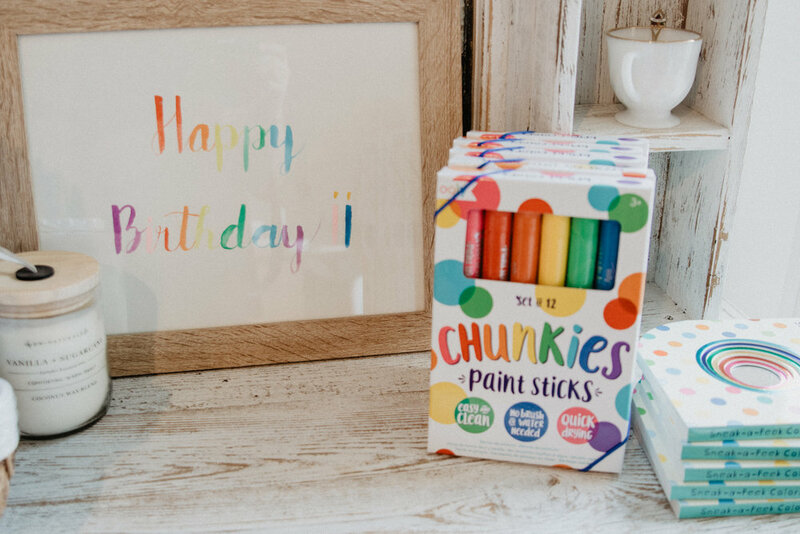 We use OOLY products almost exclusively in our houses when we do any sort of art project or colouring activity so we wanted to make sure that we incorporated their bright, beautiful colours such as Chunkies, stickers, crayons etc. into our party. 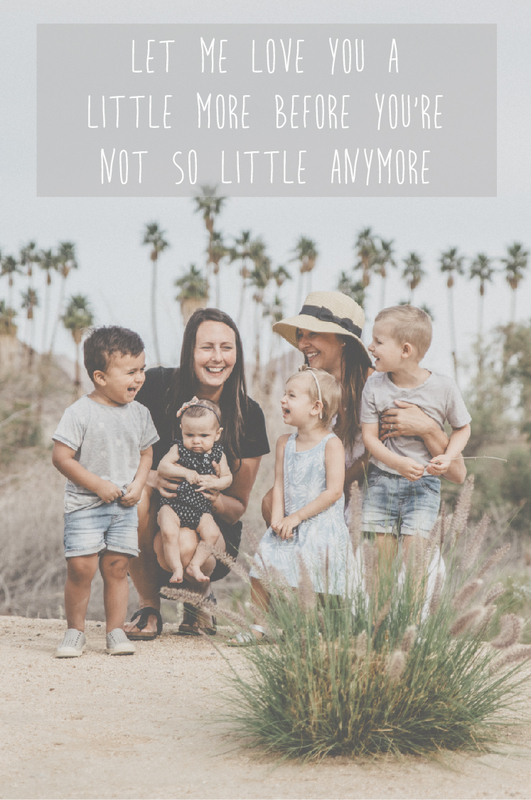 All of the kids were able to easily use their products with little to no mess and let me remind you that these are 2 and 3 year olds! I think the Rainy Dayz Gel Crayons were the most popular that morning and I love that even little fingers can pop the lid on and off and create a masterpiece in their sketchbooks from OOLY. We used white Re-Play plates, bowls and cups because we didn't need EVERY little thing to be rainbow coloured. This way, the rainbow stackers and art supplies really popped on our table next to the white dishes. We love themes but over doing it can cause it to be too much so we loved having a white table and place settings for our Rainbow themed 2nd birthday party. Again, we really wanted to keep this party simple and easy, so for lunch we had peanut butter and jam sandwiches using Silver Hill's Squirrelly Bread. One of the biggest things that we accomplished that you may not have noticed is that this birthday party was Sugar Free!! I'll say that again.....sugar freaking free. Silver Hills Bread, Pur Popcorn, KIND snacks, Go Go squeeZ, strawberries, cucumber and cheese, all made this 2nd birthday a sugar free party. Yes even the peanut butter and jam were sugar free. And guess what? The kids loved it! Go Go squeeZ were the perfect "dessert" for this party and are honestly eaten a lot by our kids when we are out and about. Our kids definitely view these as a treat and I love that they also have no added sugars! We found a few sweet books that went perfectly with our rainbow theme from Priddy Books that are great for learning colours! Priddy books has such a wide selection of books for kids of all ages so it wasn't hard to pick a couple that fit with our theme. Our kids are at just the right age for learning all of the colours of the rainbow so these books were the perfect addition to send home in each kid's goodie bag. Cairo you are T W O! You are the boy who made your daddy and I parents and you have made these first 2 years such a dream. We think you are the cutest little boy and our favourite thing lately is watching you praise Jesus in the living room. We will be having at least 6 more kids if they are anything like you so thanks for setting the bar so high for your siblings. Every day it seems like we love you more and we can’t wait to see you be a big brother. Happy Birthday!